Is Campbell Soup a Dividend All-Star? Investors in the storied canned-soup company are getting a pay raise. Should others jump on board? Campbell Soup Company (NYSE:CPB) may have recently popped up on the radar of investors in search of income. The company raised its dividend earlier this year, not only giving shareholders a raise but also giving a vote of confidence in its business. 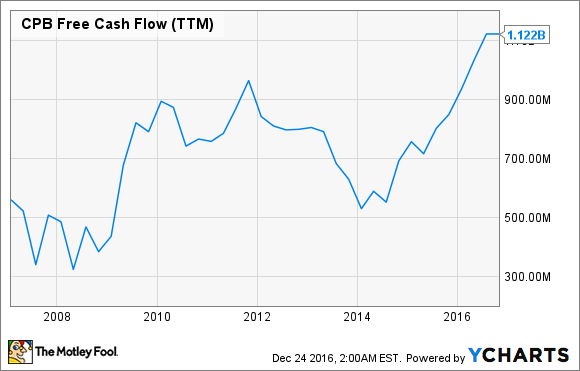 Here are the details for those looking for cash flow from their stocks. Image source: Campbell Soup Company. Campbell announced on Sept. 1 that the next payable dividend would be $0.35 per share, a 12% increase over the previous $0.312 quarterly dividend. Annualizing the new payout, Campbell's dividend yield is at 2.3% as of this writing. It's the first time the company has raised its investor paycheck since 2013. It's a nice boost for the stock and gives an added reason to consider the iconic food company. However, compared with some of its peers, Campbell lags in dividend yield and in the amount of profit paid out via that dividend, even after the recent increase. Chart by author. Data source: Yahoo! Finance. With many options to choose from in the food industry that offer a higher yield, why would one invest in Campbell Soup Company? One reason to buy Campbell is the potential for business growth, which could in turn lead to share-price growth. Where many food companies are primarily concerned with paying out as much available cash as possible to owners of stock, Campbell has been using assets to grow its business. The company has made a few acquisitions over the past few years and restructured how it organizes its business last year. The Garden Fresh Gourmet dips-and-chips maker was bought out last summer for $231 million and combined with the Bolthouse Farms business -- which makes premium drinks, salad dressings, and fresh carrots -- and the Campbell's refrigerated-soup division. The move topped off several moves aimed at capturing consumer interest in fresh and healthy offerings -- Bolthouse was purchased in 2012 and Plum organic baby food in 2013. Campbell has three divisions: Americas Simple Meals and Beverages, Global Biscuits and Snacks, and Campbell Fresh. The Campbell fresh division has been a drag on the overall company this year, especially after a voluntary recall of Bolthouse Farms Protein Plus drinks and poor execution in the carrot business earlier in the summer. However, the division is in recovery mode and management sees a return to growth in 2017. The bottom line is that Campbell has diversified into a large food company and has added brands with the potential to boost overall sales. The prospect of business growth helps justify the lower dividend payout than some of its peers boasts. Paired with the potential to see the overall business grow, Campbell's dividend is also worth a look because of the company's rising free cash flow, or cash left over after basic expenses and expansion efforts are paid for. After dipping over the last few years, primarily because of the aforementioned buyouts, available cash has been back on the rise. Campbell's new businesses are starting to pay off, and the company has been looking for ways to cut costs and boost the bottom line. Whether an investor is looking for a steadily growing business for the long haul or a solid dividend payer with the potential for future pay increases, a rising free cash flow metric is important to look for. In all, Campbell Soup looks like that type of company.